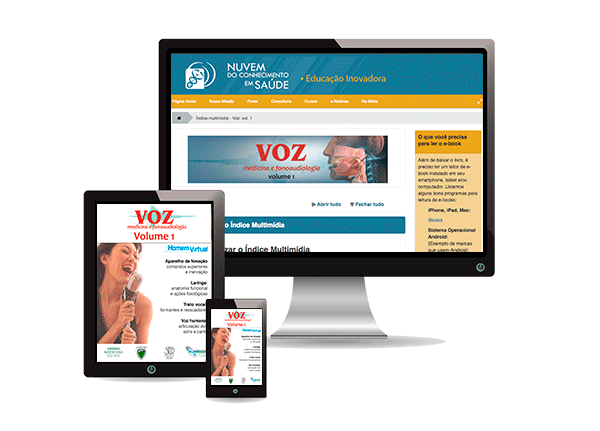 VOICE: MEDICINE AND PHONOAUDIOLOGY is a multimedia and multidevice work about phonation. It was developed by professors of the Discipline of Telemedicine of the University of São Paulo’s Medical School’s Department of Pathology, the Otorhinolaryngology – Head and Neck Surgery Department of the Federal University of Sao Paulo, and the Speech Language Department of the University of São Paulo’s Bauru Dental School. This work is divided into 2 volumes. The first one deals with the main aspects of phonation, regarding its morphology and physiology. The second volume is more focused on dysphonia and laryngopathies. The differential of this publication from many others is its multimedia content. On the next pages there will be texts, interactive infographics, clinical videos, educational objects in 3D graphic computing (Virtual Human Project) and audios that are essentials for the phonatory system comprehension. Since it is a flexible educational tool to comprehend and understand the complex process of human phonation, it may be of interest to a very large public indeed. Mainly, but not exclusively, to students and professional of Medicine, Phonoaudiology and Speech Therapy.